Use your time wisely this Thanksgiving and make use of your slow cooker! 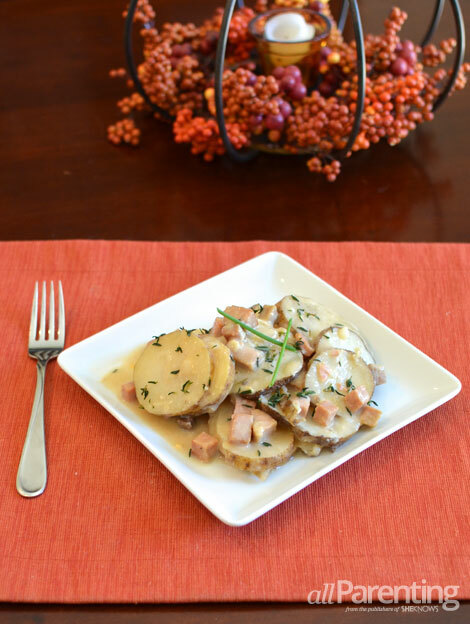 Scalloped potatoes with ham cooked low and slow make for an excellent side dish for your turkey! Do you do most of the cooking for Turkey Day? Ever have extra time on Thanksgiving Day to actually sit and enjoy family and friends? Nope. Me neither. 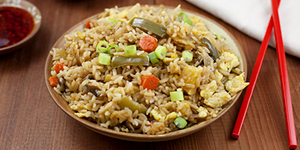 Now you can with this slow cooker side dish, perfect to pair alongside your holiday turkey. Instead of using canned condensed cream of mushroom soup, making your own is so easy, full of flavor and can be made ahead of time. Not to mention you will be skipping all of those canned preservatives. So don’t be shy. Break out that slow cooker this Thanksgiving and give yourself a break! In a heavy saucepan, add chicken stock, mushrooms, onion and thyme. Cook until tender, about 10 to 15 minutes. In a blender or food processor, puree the mushroom mixture, leaving some small chunks of mushrooms. Set aside. In the saucepan, melt butter over medium-low heat. Whisk in flour and keep stirring until smooth and bubbly. Add the half and half, salt and pepper and mushroom mixture. Bring sauce to a gentle boil. Cook, stirring constantly, until it thickens. Taste and add salt and pepper, as needed to taste. 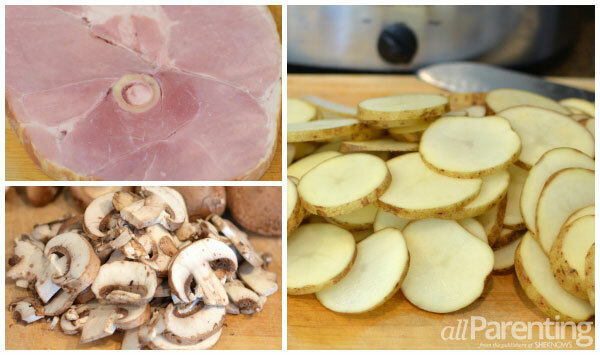 Layer sliced potatoes and ham in slow cooker. Combine homemade mushroom soup mixture, water and cheddar cheese in a large mixing bowl. Pour mixture over potatoes and ham. Cover slow cooker and cook on high for 3 to 4 hours or until potatoes are tender. Reduce slow cooker to low and cook for another hour. Serve and sprinkle with fresh thyme and snipped chives.